A passable B-movie, although it's decidedly less well known than Foxy Brown, Coffy and/or some of the other entertaining albeit exploitative American International Pictures (AIP) efforts from the studio that made them with assembly line like efficiency, Friday Foster still marks a worthwhile final hurrah for actress Pam Grier and the production house which made her a star. 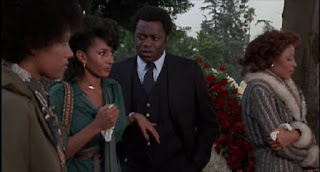 Based on the first comic strip to not only feature but revolve around an African American woman in the lead role via author Jim Lawrence and illustrator Jorge Longaron's eponymous syndicated Chicago Tribune endeavor which ran from 1970-1974, the last thing 1975's Friday Foster suffers from is a lack of material. Yet unsure whether to make an action movie, thriller, romance, chase film, or comedy, writer/director Arthur Marks decided to go with a one size fits all approach. Asking those on both sides of the screen to juggle a handful of subplots and twice as many characters before we've even reached the end of the first act, soon enough the briskly paced yet tonally uneven 90 minute feature morphs into an illogical three ring circus that even the unflappable Grier cannot save. Still the overly ambitious script is the least of Foster's worries as Marks' head-scratching direction and Stanley Frazen's bizarre editing magnify the picture's flaws all the more. Swinging like a pendulum from one extreme to another, Friday's problems are perhaps best epitomized by a scene where Grier (naked yet still in full makeup and jewelry) takes a seductive shower mere seconds after witnessing the murder of a good friend in one of the film's campiest juxtapositions. I'll say this for the movie; it undoubtedly helped sharpen the actors' poker faces. 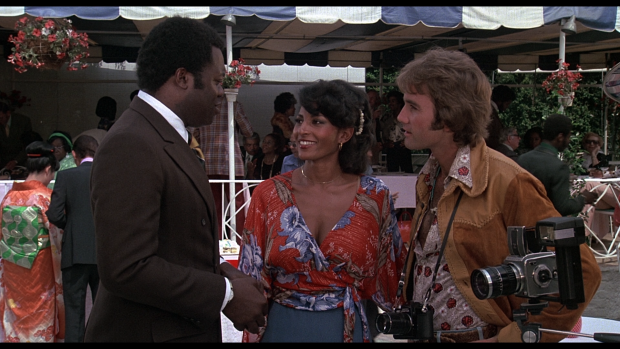 But it's a damn shame since Grier is well-suited to the titular role as former model turned photojournalist Friday Foster. Refreshingly relying on her talent, brains, and charm to uncover a vast political conspiracy, Grier's Friday turn is in stark contrast to the vengeance fueled "badass chick" parts the then-typecast actress had played in American International's earlier '70s fare up until that point. Working well with an all-star talent roster including Eartha Kitt, Scatman Crothers, Carl Weathers, and a scene-stealing Yaphet Kotto, given the years of comic strip material to cull from and Friday Foster's capable cast, it's unfortunate that Marks couldn't have offered his leading lady (and her legions of fans) something worthier of her talents. Released on disc from Olive Films alongside some of her biggest AIP hits, the now over forty year old film has been given a flawless transfer to high definition Blu-ray. Paying tribute to the vintage 1975 poster and ad campaign (complete with retro box art highlighting the original tagline of "Wham! Bam! Here Comes Pam! "), the movie looks and sounds like dream, easily getting its disco title theme stuck in your head as it fires out of every speaker, showering over you Studio 54 style in 5.1 surround sound. 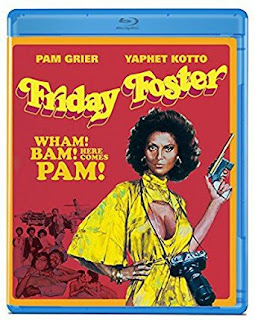 Less stellar than entertainingly tongue-in-cheek, Friday Foster is still worth checking out, not only as a forgotten Grier feature that could easily be remade for the better but also as the one that – for better and worse – placed a greater emphasis on smiling, brainy Pam in a long overdue lead role than "Wham! Bam! Action Pam."